Are you ready to head out into the world as an undead nightmare? Well, unless you want to go all in and get attacked by a creature then you'll have to learn how to create an undead look. A deathly pallor is one thing, all you need is some pale makeup and some serious dark makeup for bags under your eyes and shadows under your cheekbones. Oh, and let's not forget some blood throughout your look. One thing that will bring your costume from a ghostly look to a walking, flesh-hungry zombie? A realistic undead texture! 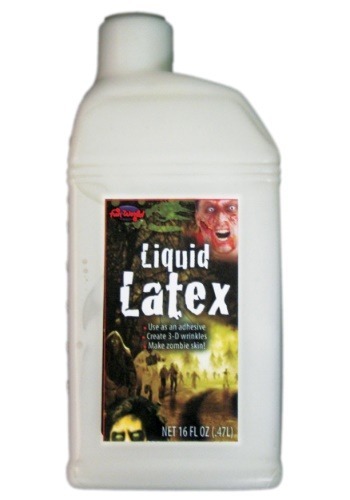 This product will bring your face from spooky to horrific. It contains sixteen ounces of fluid latex that you can apply in various ways. Make sure you test an area of your skin to make sure you don't have an allergic reaction to latex. You can use a remarkable number of techniques for wounds, skin imperfections, and rotting flesh. You can even use it to adhere prosthetics to your skin. However you use it, you're sure to enjoy your macabre new facade. So, whether you are heading out with a whole horde for a zombie pub crawl or you're patient zero and you're simply going out for Halloween, you'll have a great time heading out with a realistically horrific face! And hey, if the zombie apocalypse does come maybe you'll even sneak through the masses unscathed.